So...back in the middle of January, I blew out my knee. Thus began a concerted 2-month effort to walk properly and climb stairs again. Arthroscopic surgery happened at the beginning of February and physiotherapy began shortly after...just in time to be walloped with a huge mid-winter cold. I've been laid up for some time. All of this to explain a lack of blog posting...it's been a while. Anyway, back in the saddle. Here's a quick catch-up post. Painting is a 4-Letter Word, episode 3 from January. Better late than never! I'd have to say that the best hobby time I've had over the past several months has been our monthly painting nights. We usually get five to seven local hobbyists (including a core of podcasters from Hobby Night in Canada) out for these events, and they've really been a good time. 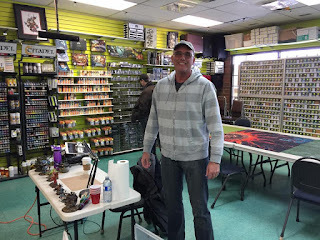 Back at the beginning of February, I took a flight down to Vegas and attended the LVO. It was huge this year. The 40K tournament alone was well over 400 players. And Vegas was good to me during the trip. Won a number of jackpots, including this sweet one for 2Gs...which really went a long way towards paying for some exorbitant hobby purchases! Gaming-wise at the LVO, I was focused on Dropfleet. Played a number of games. Including one against birthday boy, Ward Kapach. Also attended a great painting workshop run by Aaron Lovejoy. Learned how to weather model surfaces with latex mould builder and acrylic paint. More Dropfleet at the Tuesday Night Game Club. And joined a Dropfleet escalation league up at Mission Fun and Games, run by our local Hawk Talon, Trevor. Our first game day saw 10 (!) players come out. Amazing. While it's been pretty quiet for me on the painting front, I did manage to churn out some Dropfleet clusters with resin sector objectives from Hawk. To finish up with this catch-up blog, I also ran a painting workshop up at Thunderground last Sunday. We had a good turnout, and I was able to share some fun techniques with the guys who came out. Well, got lots of games in, despite being hobbled for the last several weeks. And Vegas was lots of fun.